At a small party with close friends one evening, these fried leeks, which I’d had leftovers of in the fridge and almost didn’t bother to put out, were the hit of the night. 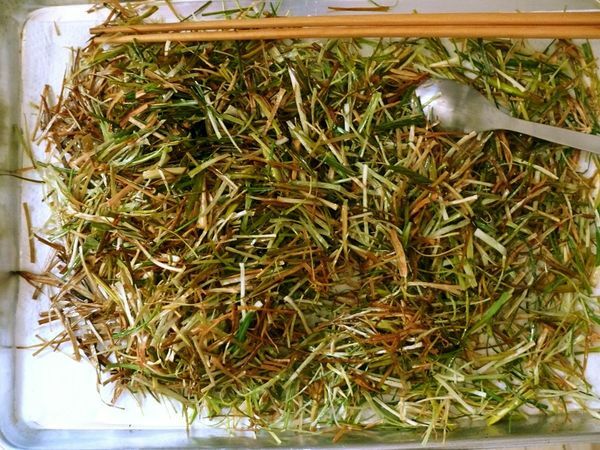 Meaning, never mind what I’d sweated over, the fried leeks my aunt made days before and had wanted me to try was what everyone loved most. That happens. She adds a special touch to everything and this is no exception – she approaches the preparation of these leeks with meticulous care. So do what you will to make the recipe your own, but adhere to her technique. 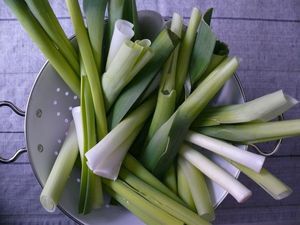 The leeks are not sliced into rounds or half moons, which would be much faster but would create disparate sizes. You’d end up with inconsistently fried leeks–the main problem–and they’d fry up to be tight curls that trap more oil, rather than these whimsical wisps of leeks that stay crisp for longer than you’d think. As for the blend of spices, you do not have to be as particular as my aunt. She uses curry leaves from her plant, fried and crumbled, and red chili powder from peppers my dad dried and crushed. Those of us without these artisan items at our disposal can use store-bought curry leaves and chili flakes, and though I wouldn’t want you to skip these ingredients, you could even season solely with salt. While I did not invent these, I discovered their raison d’etre: to be the single best beer snack ever. 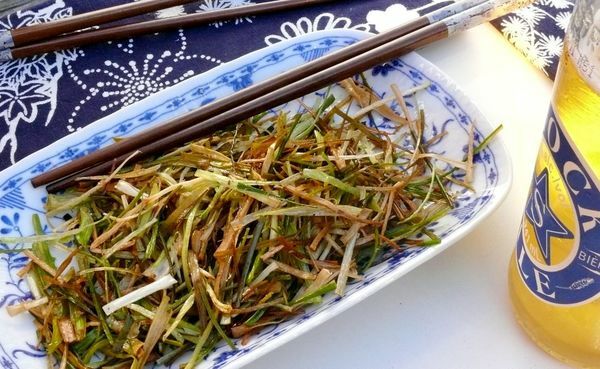 Serve with cold brew and chopsticks–or forgo the chopsticks since everyone quickly moves over to eating them with their fingers. Like chips. This makes a large batch but leftovers store decently refrigerated in an air-tight container once fried. Feel free to halve or quarter the recipe. Heat about 2 inches of oil in a large, heavy-bottomed, high-sided pan or wok (the oil should not come more than half way up the side of the pan), to 375F degrees. 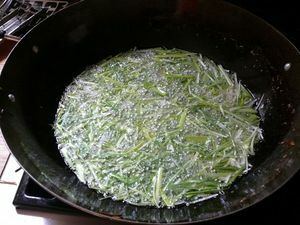 If you do not have a deep-fry or candy thermometer to check the temperature, test with a couple of leek pieces which should brown in under 1 minute. Working in safe batches (the oil will bubble up considerably when you add the leeks), add a small batch of sliced leeks to the oil. Fry for 30 seconds to 1 minute, stirring a little to stop them from clumping, until the leeks are just starting to turn golden. 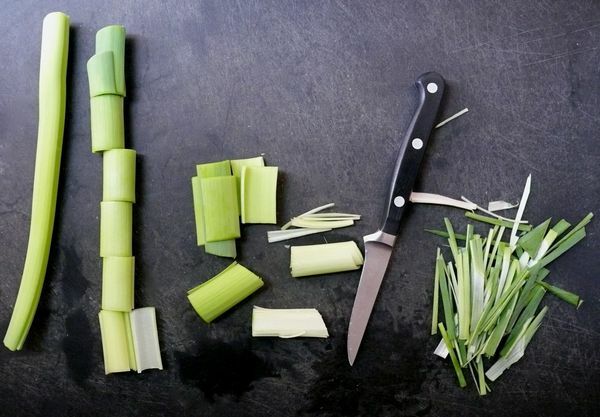 Using a slotted spoon, gently remove the leeks from the oil, shaking off excess, and transfer them to paper towel-lined sheet pans or plates. Allow them to cool slightly, then season with salt and chili flakes. 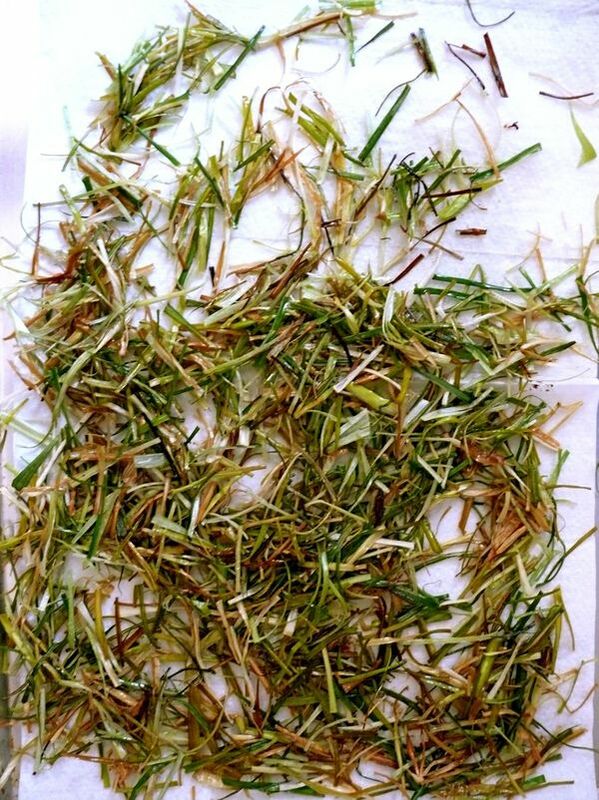 Repeat with remaining batches of leeks. Then, if using curry leaves, add them to oil and fry until crisp. Drain and cool, then crumble them over the fried leeks. Toss leeks well in seasoning and serve at room temperature or completely cooled. They will be as crisp as fresh potato chips, and stored properly in an air-tight container in the fridge, will stay that way for as long as a couple of weeks. Perfect served with cold beer, chilled cocktails or fizzy drinks. This story and recipe appear in APPETIZERS, Issue 007 of Le Sauce Magazine.